Jeffrey Holden (left) and Tyler James (right) face off on Saturday, April 21, 2018 in the semi-finals at the USBC Intercollegiate Singles Championships (Photo: CCSJ Athletics). LINCOLN, Neb. 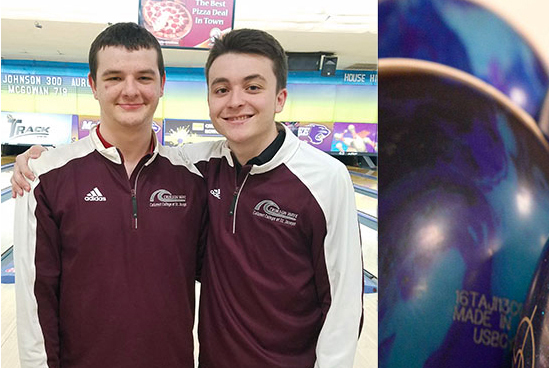 – For only the second time in school history, the Calumet College of St. Joseph men’s bowling team will have someone play in the semi-finals at the USBC Intercollegiate Singles Championships. Well, make that the second and third time actually. Both Tyler James (JR/Deltona, Fla.) and Jeffrey Holden (JR/Salem, Ore.) beat their day two opponents to secure their spots during in the television rounds coming up this Saturday in Lincoln, Neb. Jeffrey Holden qualified as the 14th seed and started off against Brandon Magennis of Martin Methodist in round one. Holden just squeaked by beating his competitor 601-592 to move onto the second round. Holden had a much easier time against Hunter Kempton of Lincoln Memorial University, downing his opponent from LMU 599-530. Finally, his third round match was the best one of all, handily winning against Brian Bourget of Robert Morris 654-530. Much like his teammate, Tyler James qualified 23rd and had to play on Tuesday to earn his spot into the Wednesday morning matchups. James had a tough battle waiting for him in round one, taking on Tyler Cortez Schenck of Wichita State. Schenck was not only a member of the Shockers squad, but a member of Team USA as well. This was no matter to James, who took him down 579-527. 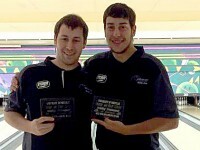 From there, James cruised by Andrew Dekowksi of William Paterson University and Adam Glickman of Webber International University by the scores of 679-622 and 638-620 respectively. Unfortunately, this is where James and Holden stop being teammates and start becoming foes. On Saturday morning, the two Crimson Wave members will face off against each other in the national semifinals. On the line will be a spot in the national championship round, guaranteeing that CCSJ will have a bowler vie for the title of best in country for the first time in school history later that day. Saturday could become even more historic as the team portion of the tournament kicks off tomorrow. The Wave will be looking to back up their number one spot in the country with the biggest tournament win of them all. The squad will roll on Thursday and Friday, with the top two teams going head to head for the championship on Saturday. You will be able to watch all of the proceedings at https://www.youtube.com/user/BowlTV.